Deserts are like seas of sand. The features of the landscape are constantly moving and changing like waves locked in slow motion. Much like the ocean, regular patterns form out of the chaos, which scientists have long sought to understand. A team from Paris has now developed a new model that can accurately simulate the movements of sand dunes that almost seem to sprint across the surface of the Earth or Mars. It can take years for a sandscape to fully remake itself, so scientists seeking to understand how the wind changes the topography have to rely on simulations and computer models. They found that the formation of sand dunes is surprisingly similar to a fizzy soda. The University of Paris-Diderot studied a specific kind of sand drift called barchan dunes, which look like giant granular croissants. Often they're found in giant fields with long lines of them stretching for miles across the landscape. The wind blows them across the desert too. Of course, the wind isn't blowing the thousands of tons of sand across the desert en masse. Instead it picks up sand, grain by grain, and blows it downwind, gradually moving the whole drift. This way the sand dune isn't really being moved per say, but constantly eroded and redeposited slightly farther downwind. Smaller ones seem to move faster than the larger ones, and even seem to pass through each other. 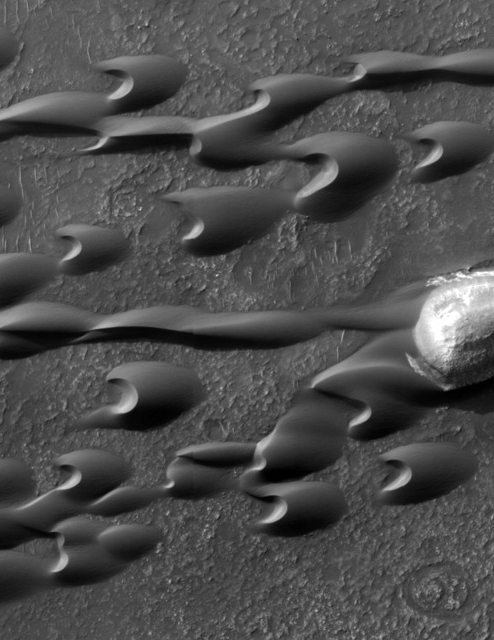 When these dunes first form out of seemingly empty desert, physicists say they "nucleate." It's a term used in several fields of physics, but usually not geophysics. When a substance nucleates, it spontaneously changes its phase of matter at a small, localized spot. Think of a bottle of cola. When it starts to fizz, the bubbles are the nucleation points where the carbon dioxide in the soda turns from liquid to gas. It works the other way. 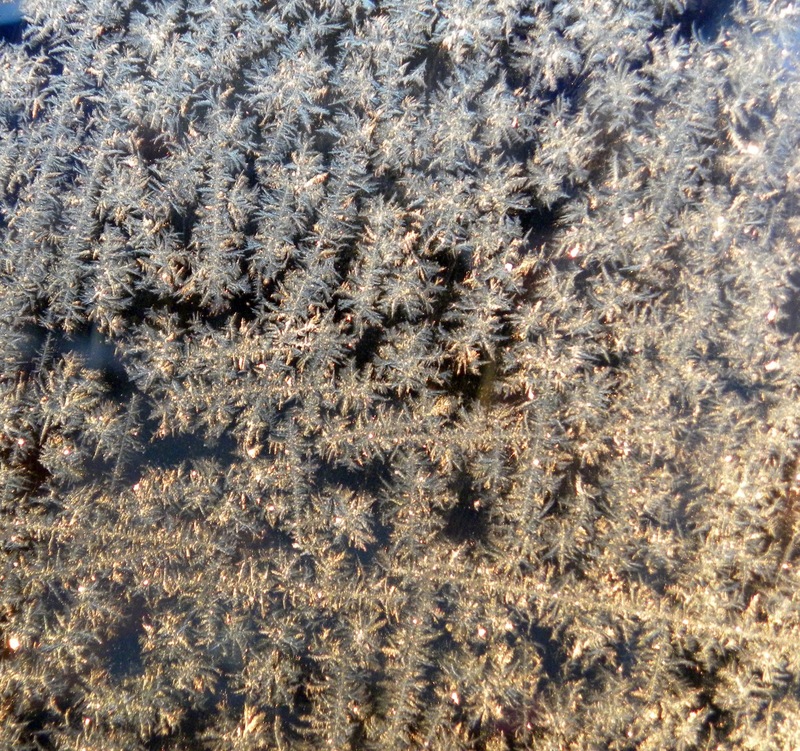 The frost on a car's cold windshield are the nucleation points where water vapor in the air froze to a solid. The idea is the same on the surface of the desert. 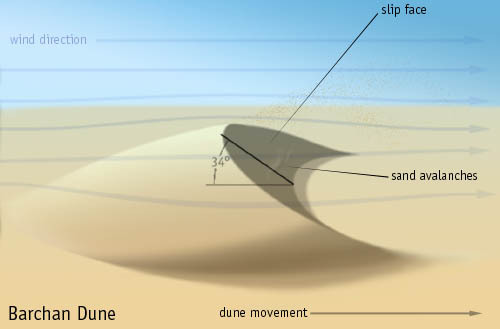 The dunes are the points where the blowing sand changes from its one state billowing across the open planes to being trapped in a dune. 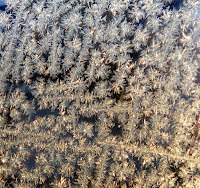 Where the dunes form is pretty random, just like how frost seem to form haphazardly on the window. Their crescent shape shape comes from the wind is constantly blowing in one direction. Wind blowing over the top of the dune creates a vortex just behind its peak, carving out the inside of the mound. 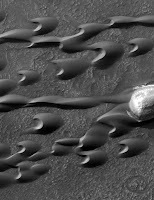 The two horns this mini whirlwind creates sends lines of sand flying past the dune, as the breeze picks up sand from its face, and carries it downwind. The physicists found using their model that if a dune is by itself, these two flying streams of sand usually just disperse into the desert. However if a big field has formed, they can seed each other forming long straight lines downwind. One dune seeds the next which in turn seed even more dunes, creating these vast rows of crescents across the desert.These long rows tend to have shorter dunes which move faster. This way, the dunes in the line are always changing shape and positions, but the width of the line itself stays pretty much the same.